The defence secretary has paved the way for air strikes on Islamic State fighters in Syria, saying the extremists needed to be targeted "at source". But Michael Fallon said no action would be taken without a Commons vote. The UK does not need the backing of MPs to launch raids but Mr Fallon has said they will have the final say. Labour has indicated it would not oppose military action in Syria as it did in 2013. The party's acting leader Harriet Harman said Islamic State had to be "stopped" and Labour would look "very seriously" at any proposals brought forward by the government. She said the situation was the different from that in 2013, when Labour voted against air strikes in Syria, because IS was a terrorist organisation, while President Assad was the head of a government, albeit a "terrible regime". Labour had been concerned about "what would fill the space" if the Syrian president had been toppled, added Ms Harman. She suggested terrorist attacks, such as Friday's tourist murders in Tunisia, may have been planned by IS in Syria - a point also made by Michael Fallon. Thirty of the 38 tourists killed on the beach in Sousse on 26 June have been confirmed as British. Student Seifeddine Rezgui, 23, said to have had links to IS, was shot dead by police after carrying out the attack. Michael Fallon was dipping the government's toe in the Opposition's water. The defence secretary has long believed it is not logical to limit air strikes to Iraq when the terrorists do not respect, or even recognise, borders. But he stressed that the government would only widen the RAF's operations to Syria if he could gain "some consensus" in Parliament. So while any air strikes in Syria would be unlikely to go ahead until a new Labour leader is in place in September, Mr Fallon would be encouraged to hear acting leader Harriet Harman and shadow defence secretary Vernon Coaker say they would consider any proposals seriously. Their support is important, because David Cameron would not risk going down to defeat as he did over the separate issue of air strikes against the Assad regime in 2013. But there were other signs that a consensus could be difficult to achieve. Some Conservative backbenchers raised doubts about further military action in the absence of a wider diplomatic strategy. Others had legal concerns. And former SNP leader Alex Salmond - now the party's international affairs spokesman - denounced previous military interventions in Islamic countries and said he was "sceptical" about any future ones. Mr Fallon told MPs a "full spectrum response" was needed to deal with IS at its source. "We will not bring a motion to this house on which there is not some consensus. "Our position therefore remains that we would return to this house before conducting air strikes in Syria." BBC political editor Nick Robinson said Mr Fallon's comments were not a call for imminent action, but were "preparing the ground" or "pitch rolling" for a change in approach. Media caption"We will not bring a motion to this house on which there is not some consensus"
Prime Minister David Cameron later said IS posed "an existential threat" to the West, and its members in Iraq and Syria were plotting "terrible attacks" on British soil. Downing Street said Mr Cameron believed MPs should be thinking about whether UK forces should be doing more to tackle IS. But Mr Cameron's official spokeswoman said the issue of further military action needed to be considered "properly and carefully" before any decision was taken to ask MPs to back any specific action. She said Britain was already flying surveillance and air-to-air refuelling operations over Syria. On Thursday evening, the prime minister discussed the threat of Islamic State with the Crown Prince of Abu Dhabi Mohammed bin Zayed Al Nahyan, at Downing Street. No 10 said both leaders agreed that IS - or Isil, as the government calls it - "must be defeated". The spokesman said the PM restated the support the UK was giving to the Iraqi government, including participation in coalition air strikes and providing training to Iraq's security forces. On Syria, the two men agreed that President Bashar al-Assad "was a cause of the conflict" and discussed the viability of a transitional government and the need to tackle the humanitarian situation, the spokesman added. Mr Cameron was defeated in the Commons in 2013 when Tory rebels joined forces with Labour to oppose air strikes on Syrian government targets designed to deter the use of chemical weapons. The 2013 vote focused on the Syrian President Bashar al-Assad, not IS militants. 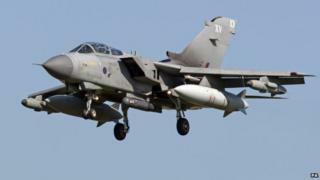 Parliament approved UK bombing of militant positions in Iraq last year. However, MPs were not asked at the time to authorise strikes across the border in Syria. The Iraqi government requested allied military support in its fight against Islamist militants but the Syrian government of Bashar al-Assad, whose country is in the throes of a four-year civil war, has not made a similar request. The SNP's John Nicolson said he would be "very sceptical" about any intervention. Conservative MP Crispin Blunt, who chairs the Commons Foreign Affairs Select Committee, said he would want to know whether any intervention would be a "battle-winning decision". What was "frustrating" was that the debate around military action in Syria "is not going to make any difference to the outcome", he said, adding that diplomatic activity and getting regional powers together were key to finding a solution. The bodies of nine more of the British tourists shot dead in the Tunisia beach attack have arrived back in the UK at RAF Brize Norton in Oxfordshire. Media captionRUSI's Professor Michael Clarke: "sooner or later someone has got to take IS on [in Syria] at the centre of their power"
On Wednesday the coffins of relatives Adrian Evans, Charles (known as Patrick) Evans and Joel Richards, as well as Carly Lovett, Stephen Mellor, John Stollery, Denis Thwaites and Elaine Thwaites, were flown from Tunis on an RAF C17 and taken off the plane one by one. The repatriation of all the bodies is likely to take several days. Downing Street has ruled out an inquiry into the attack, but said Scotland Yard would assist the Tunisian investigation. A minute's silence will be observed across the country at noon on Friday in memory of the victims, and matches at Wimbledon will start later so players, spectators and staff can take part. Most of the Britons killed have now been named. Here's what we know about those who lost their lives, as well as those still unaccounted for and the injured. Survivors have also been speaking about their ordeal.